With the free-from market growing exponentially, take a look at why expanding your milk offering is key to maximising the UK’s untapped market of coffee lovers. Coffee sales currently create £9.6 billion in revenue in the UK, a figure which is expected to increase to £13 billion by 2022*. Yet despite the market soaring, there still remains an untapped market of coffee drinkers, offering a significant, potential income for coffee & restaurant operators. With quality coffee available to purchase on every high street, consumer’s standards are continuing to rise, with the spotlight on every component of the drink – especially the milk. 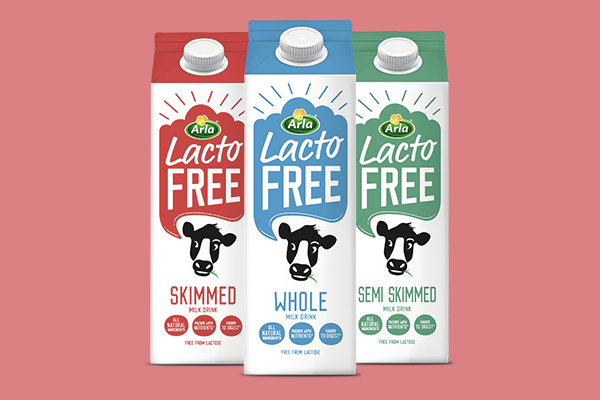 Arla's Lactofree range provides you with protein, calcium, vitamins and all the other goodness of regular dairy. And none of the lactose. It’s feel good dairy with all the performance to work in your coffees time after time. This means your consumers can slurp, gulp and guzzle their favourite coffee knowing they will have the feel good* feeling from drinking Lactofree. *Vitamin B12 contributes to the reduction of tiredness and fatigue. Calcium is needed for the maintenance of normal bones. Protein contributes to growth in muscle mass. Easier to digest for those who may have gastro-intestinal discomfort caused by lactose intake. Not suitable for milk allergy sufferers. If in doubt please consult your doctor.